Modern vital documents are written in such a way that it fits one individual and only one. Why? For instance, if a household is part of a census, there are many information pertaining to each member of the family: the name and the age of each one, the maiden name of the mother, the location of the household, the house number, the birth place of each one of them, the siblings, and so forth. Every bit of information contributes to distance each individual from others in the same area with the same family name. The religious documents of the 18th century are sometimes the only source of information that can be found about an individual. Philip was living in the USA and Canada at a time where churches were being built here and there. You would leave a trace in the church registers, if you got married and if you had your children baptized. You would leave a trace also in civil registers, if you had received a land grant or participated in a census. If your ancestor was lucky enough to live in a community where someone was well educated and wrote about the community, his name could be mentioned in his writings. Your ancestor would leave a much more profound trace, if he was part of the army. Because a war was going on in the USA and because Philip was part of it, we were « blessed » by a series of muster rolls on which his name appeared as a soldier. But, how sure are we that his name on a muster roll corresponds to him and not to somebody else by the same name? In the case of Philip, the circumstantial evidence and documents seems sufficient to say that our ancestor was a member of the King’s American Regiment and that he received a land grant for his participation in the ARW as a Loyalist. One document was not enough, but, since he left a trail of documents, it is largely enough to prove that he was present in the USA at the time of the ARW. You already know about this collection of documents reported in Benoît Long’s document, which can be made available to you anytime upon request. from 1680 to 1780 (122 passengers). I can send it to you on demand. The main characteristic of these military documents is their continuity. They are all military documents (nature) and the dates follow each other in a continuous flow (chronology). They are extremely well knitted together. Moreover, he said, to American censors in 1831, that he was an American Loyalist. Years before, he said the same thing to John Mann, a writer from Scotland who met him at Lac Témiscouata. This is not hearsay: these are historic documents from people who met Philip himself. I take these particular documents at their full face value and make sure that I never loose sight of it from then on. He kept a strong relationship with British officers during his entire life. He became a civil servant when he had the responsability of carrying the Royal mail between Quebec and Fredericton. The nature of his relationship with the British government represents also a sound and expected continuity in his life. and presented by previous researchers is additive and overwhelming. Most of the 18th century documents are what I call « stand-alone » documents. They give a specific information without any context. For instance, the name of an individual appears on a census. It only says that this individual lived in that community at the time of the census. If you’re looking for the presence of a woman not at the head of a family, her name is not mentioned anywhere. What a shame! 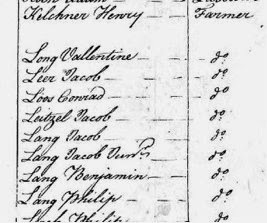 If I find a Philip Long on a census (like the one above), it doesn’t mean at all that it is about my ancestor. The name Philip Long was quite common, for instance, in Pennsylvania during the second part of the 18th century, especially after he had left USA. How can I be sure that a Philip Long who appeared on a census or on a birth certificate in Pennsylvania is or is not about my ancestor? There were other individuals by the same name in Pennsylvania and in other States during that period. The information gathered on each one of them shows that they all stayed in the USA after 1783. They are relatively easy to cancel out using a technique called « cross-referencing » which means finding contextual information showing that this particular Philip Long was not a Loyalist soldier, or that he died at that place, or that he was a Patriot soldier, or that he received a military pension after the war for many years afterwards, so on and so forth. Most of the serious researchers of Philip Long know about all these « candidates » in the USA or in the British Isles. My research in Pennsylvania has uncovered some more candidates, but not one seems to fit my ancestor’s profile. 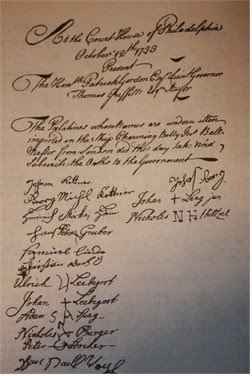 The bulk of Loyalists was in New York rather than in Pennsylvania. 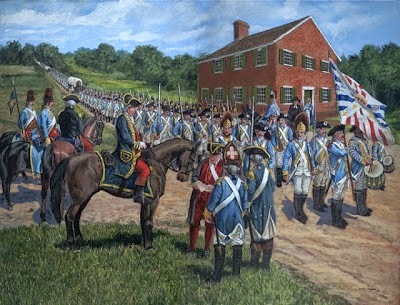 Many Longs participated in the ARW, but on the Colonials’ side, with the Patriots. The main difficulty for us on this side of the Atlantic is the fact that it took more than a century to build up a system of recording basic statistics about the population. If your ancestor immigrated to America during the 18th century, you will be lucky if you find his name on a passenger list (most of them were destroyed) or on a primary census done every seven years in a few States. For many descendants of these immigrants, a DNA test is, nowadays, the only way to « guess » where your ancestor lived before they immigrated to America. The lack of written information has rendered DNA testing immensely popular. Is it possible that Philip could have been a citizen born in the Southern States without ever showing up in vital documents because he was staying at his father’s place until the ARW started? Even if it seems improbable, it is still possible. He could also have immigrated in the USA while he was a child and stayed at his father’s place until he decided to enlist in a Loyalist regiment. After all, there were strong Loyalist families and communities in the Southern States. I found one Philip Long from South Carolina and another one in Pennsylvania, but they were Continental soldiers. I was able to prove that they stayed in USA well beyond the 1783 date.